An exotic twist to my mother's pumpkin soup recipe. Makes for a rich and inspiring autumn dish that will leave you feeling warm and satisfied, physically and intellectually. 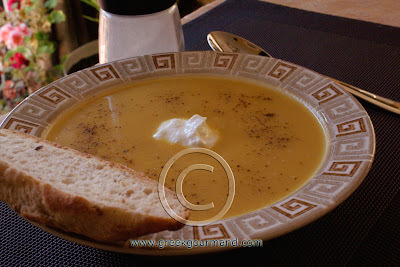 Mastic (or Mastiha) Pumpkin Spice Soup for autumn lunch. Click to Enlarge. It is exciting times on the Greek culinary front. The Greeks are re-discovering one of their ancient aromatics, the rarest spice on the planet: mastiha (mastic). As exciting a development as this may be, it is a situation fraught with gastronomic risks. In the drive to incorporate mastiha into a “Greek” cooking palette and create new taste sensations, there have been some interesting offerings coming out of test kitchens all over the planet. Working the resin, mastiha, into a dish is not an easy thing. One must be familiar with the flavour of the aromatic and that takes practice. It is a good idea to buy the raw resin crystals and chew them to acquire the scent. When you do, you will realize it is a challenging flavour to incorporate. Mastiha, like any natural resin, is a concentration of the humours and juices of a tree or shrub. It is a distillation; the essence of its host. Mastiha is the spirit of the lentisk tree. An accounting of the flavour of mastiha has never been put forward in any great screed. This posting will be a short attempt to outline a flavour profile and to provide some food for thought on the matter. Comments are encouraged. There is definitely something borderline unpleasant in the mastic scent and its flavour. Too much mastic can ruin a dish. It is the spice rack’s equivalent of eating blowfish, one wrong move and it’s over. Handle with care. One of the resins involved in the embalming of ancient Egyptian pharaohs has been determined to be an inferior form of mastic resin, which was the product of a Cypriot cousin of the Chian lentisk shrub. Tests on Egyptian mummies have confirmed the presence of this resin. Today, one of the more widespread commercial uses of mastic is for the varnishing of paint(ings). Interestingly, terebinth (the original turpentine trees) are also related to the shrub which produces mastiha. So, mastic is somewhere between a preservative and a solvent. It can go either way with such substances. As to the flavour itself, it has a peculiarly pharmaceutical quality to it. Whether in liquor form or as a flavouring agent, mastiha retains something of a medicament in its clingy aftertaste which verges on but never quite achieves the “green” character of a pine informed flavour; it lacks a sense of the verdigris that makes pine "piny" (ironic though it may be). The mastic redolence is of a drier nature than the more commonly recognized verdurous pine scent. Though the mastic tree is an evergreen, it is not of the coniferous genus. I don’t want to mislead anyone into thinking they will find familiar piny overtones in mastiha, because they won’t. It is different; it has something faintly akin to the character of green pistachio in its makeup, which is not surprising as the lentisk is related to the pistachio tree. This probably explains why I’ve always liked pistachios with my mastic-flavoured ice cream(s). To ship this recipe, I am hoping this attempt at an explication of the mastic flavour is sufficient to encourage you to try my soup as outlined below. I believe I have achieved a balance of flavours that allows the mastic to offer its more palatable, saporous qualities. Do let me know if you try it. I think it will make an excellent addition to any Thanksgiving table. 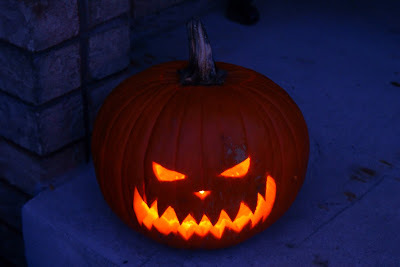 For what it's worth, I used the innards of our Jack O'Lantern Hallowe'en pumpkin for the recipe. I carved this pumpkin for our son's first Trick or Treat. Click to Enlarge. Heat butter and olive oil in a large pot; add onions and sauté until soft. Add broth, spices, salt, pepper, mustard and water to pot, stir and bring to boil; add shredded pumpkin pulp to pot, stir and cover to boil. When boiling, lower heat to medium low, keep pot covered and let simmer for 30-40 minutes. When the pumpkin pulp is sufficiently softened, use an immersion blender and puree the soup to a creamy consistency. Cover and let simmer for an additional 5 to 10 minutes, then serve with a dollop of Greek-style strained yogurt in each portion. Makes 8 servings and good to freeze for reheating. Copyright © 2008, Sam Sotiropoulos. All Rights Reserved. This blog is intended for personal non-commercial use only. Please respect my work and recipes; also respect my copyrights and intellectual property rights and do not copy without permission.